The Point Puzzle is a weekly puzzle challenging listeners with word puzzles and logic puzzles. Every week a winner from the last week is selected from emailed answers and announced on air and a new puzzle is posed. The puzzle airs on KPOV on "The Point" on Wednesday mornings between 9:00 am and 9:30 am and replays at 5pm just before Open Air. I’m looking for a country name that can be split into two English words. Then switch the leading letters of the two words and you will get two new words. Click here for the text of some past point puzzles. 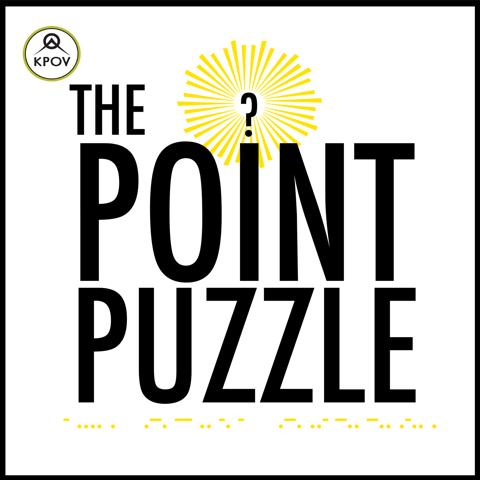 The Point Puzzle is produced at KPOV in Bend Oregon, but it is also carried on stations around the country. If your station would like to carry the Point Puzzle, contact Pearl. The Point Puzzle is distributed through PRX and Audioport. If your station is not a member of PRX or Audioport, please contact Pearl to discuss other arrangements.